36" Pull Behind Black Walnut Picker Upper - Black Walnut Cracker for Serious Nut Crackers! 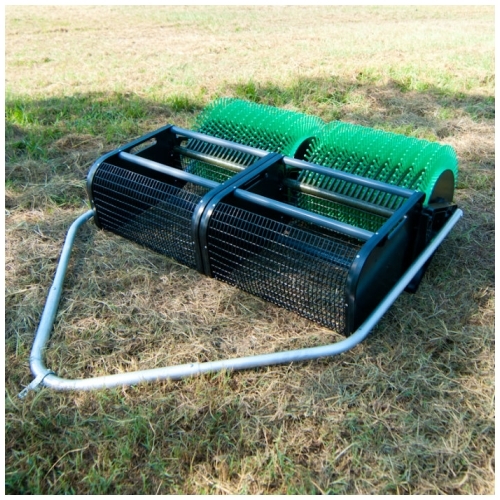 Attaches to your riding lawn mower, golf cart or ATV! Need an effective took for picking up Black Walnuts and other large nuts? Our most heavy duty product in Bag-A-Nut Nut Picker Uppers, the 36" Pull-Behind Black Walnut Nut Roller attaches to your riding lawn mower, golf cart or ATV. As you drive, the multiple wheel roller gathers your nuts in the "magic fingers" and once rolled against the basket extenders, ejects the nuts into the double collection basket. Extra wide in length and double baskets means more nuts in less time! This simple design gives maximum results. Watch how effective our Pull-Behind Nut Roller is! This saves me so much time. I plan to buy one for my dad. Wow! Great concept. I would buy this again.